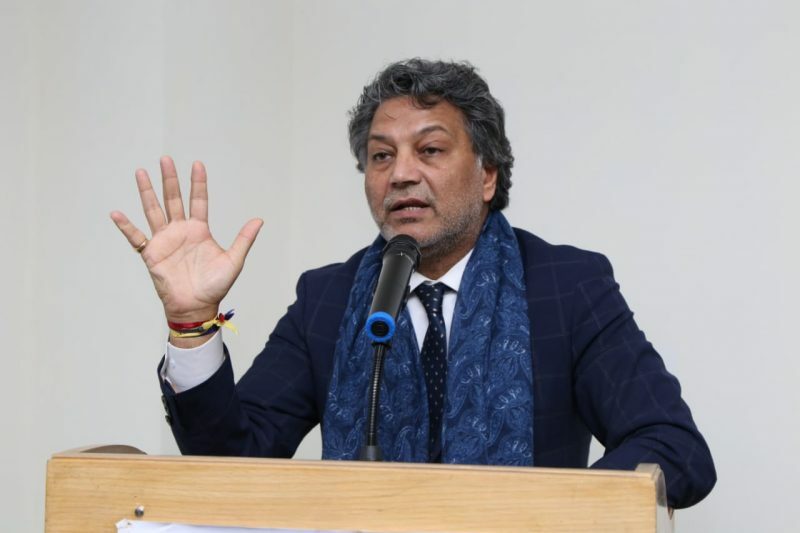 Karachi: (by Eruj Fatima): Mr. Mehmood Bhatti is not only known to be a world famous fashion designer but he is also known for his self made career and his work in philanthropy. 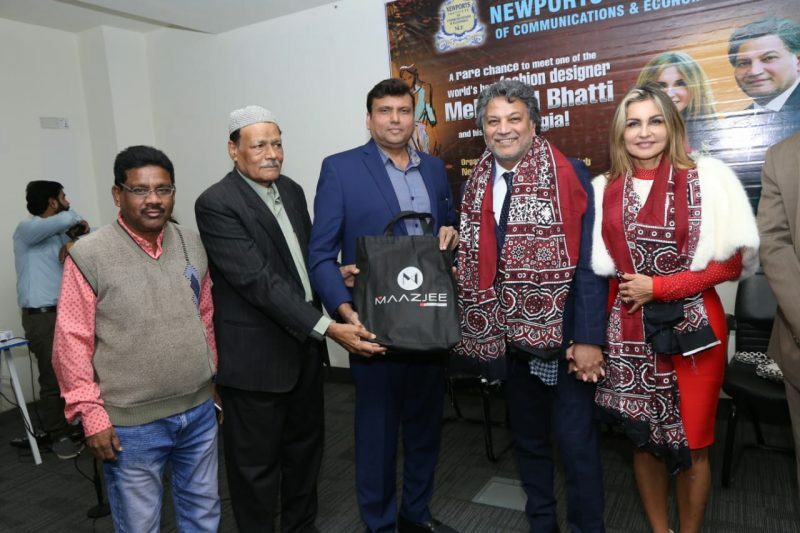 Mr.Mehmood Bhatti and his wife,Georgia,were invited as guest speakers at Newport’s Institute of Communications and Economics because of their exceptional life experiences. The purpose of this session was to make the students interact with hero who was a role model for many. The purpose of this session was to make the youth believe that with hard work,dedication,honesty and truthfulness can lead to wealth and a higher status. Tahir Mehmood Bhatti, commonly known as Mehmood Bhatti was born in a city called Lahore, Pakistan. 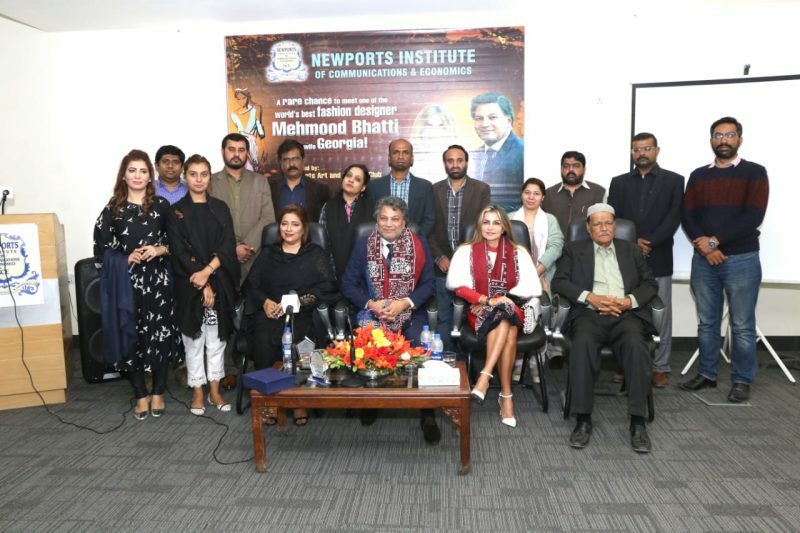 The Chairperson of Newport’s Institute of Communications and Economics, Madam Huma Bukhari in her welcome speech emphasised that just like Mehmood Bhatti any passionate Pakistani with consistency hardwork and a soft spoken nature can be successful and known for his work around the world.Along with the books when such personalities interact with the students they witness the success stories in disguise of a Human being.Madam Huma Bukhari also states that Mr. Mehmood Bhatti even after touching the skies of success did not forget Pakistan and his duties as a citizen of his country. 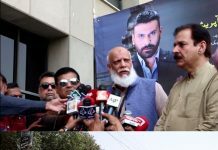 The host of the event Mahnoor Ali said that Mehmood Bhatti started his career in Paris in the year 1979. 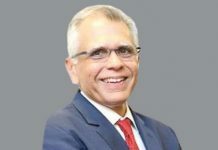 He expressed his interest in working on humanitarian projects for Pakistan. He also established a hospital in Lahore. Even after facing many hardships I did not stay behind in helping the citizens of Pakistan or staying behind my National duty, upon answering an other student he mentioned his desire to work on projects in Karachi. Huma Bukhari mentioned that the students need a personality like Mr. Mehmood Bhatti to teach them about fashion designing to which Mr. Mehmood Bhatti promised that after completing the 6 months of commitments he will visit Newport’s Institute of Communications and Economics to give lectures and conduct workshops regarding Fashion designing, he also mentioned that he will take out time for the students of Newport’s Institute when ever he visits Pakistan. 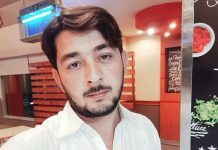 His wife,Georgia expressed her happiness and said that she was delighted to see the passion and dedication of the youth of Pakistan, She said ‘instead of loosing hope if an individual does hard work in the near future there will be many Mehboob Bhattis. At the end of the event Mr. Mehmood Bhatti and his wife Georgia were presented with memorable shields and Ajraks.